Paul Pollock's hopes of a strong run at the European Cross Country Championships didn't materialise as he finished 47th in Samorin. After winning the Irish title two weeks ago, Pollock looked capable of improving on his best of 23rd in Bulgaria three years ago. But after being prominent early on Pollock, 31, dropped back as Sean Tobin was top Irishman in 15th. In the women's race Kerry O'Flaherty was 38th and Fionnuala McCormack 12th. US-based student Tobin's impressive run helped the Irish senior men finish a higher than expected fifth in the team competition in the Slovakian town. With only the first three finishers from each country counting under the championship's new system, Pollock was one of Ireland's three discards as Mayo man Hugh Armstrong ran splendidly to place 19th with 36-year-old Kevin Maunsell the other scorer in 24th. As has been the pattern at recent European Cross Country Championships, African-born athletes took the senior titles with Yasemin Can utterly dominant as she retained the women's event for Turkey, who also landed the men's gold in the shape of another former Kenyan Kaan Ozbilen. 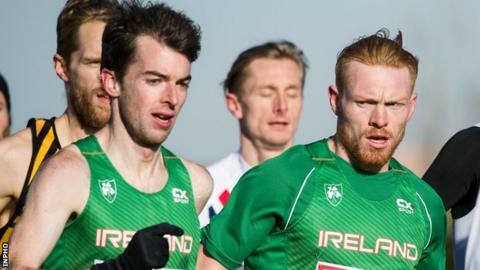 Ozbilen, who won the Antrim International Cross Country event on three occasions when he was known as Mike Kigen, finished nine seconds ahead of Moroccan-born Spaniard Adel Mechaal with Britain's Andrew Butchart taking bronze. British trials winner Ben Connor, who Pollock beat at the Leeds Abbey Dash 10K event a month ago, placed sixth as GB took the team bronze behind Turkey and Spain. Pollock's time of 31 minutes and 35 seconds in the 10.1km race left him a minute and 50 seconds behind the winner. O'Flaherty's 37th spot left her as the third Irish scorer with Shona Heaslip four seconds ahead of the Newcastle woman in 34th spot as the team finished a decent seventh. As is her wont, the county Down woman ran strongly in the closing stages on the hard and fast court to move up several positions. McCormack, winner in 2011 and 2012, was never in contention for a medal after being unable to keep pace with the leaders early on. The Wicklow woman finished exactly a minute behind winner Can with O'Flaherty a further 47 seconds back. Armagh woman Fionnuala Ross ran well on her debut in the championships to take 47th, just four seconds behind 40th-placed team-mate Michelle Finn, with Leevale's Lizzie Lee finishing 49th. Best Irish individual performance of the day was Sophie Murphy's 10th in the under-20 women's race while Northern Irish pair Craig McMeechan and James Edgar placed 37th and 38th in the under-20 men's event where Feargal Curtin was the leading Irish finisher in 22nd. With Ireland only fielding three athletes at under-23 level, Bethanie Murray finished 38th in the women's event with Eoin Strutt and Tom O'Keeffe 49th and 60th in the men's race.